You are here: Home › Writing › Coming May 4th to a Galaxy Near You! 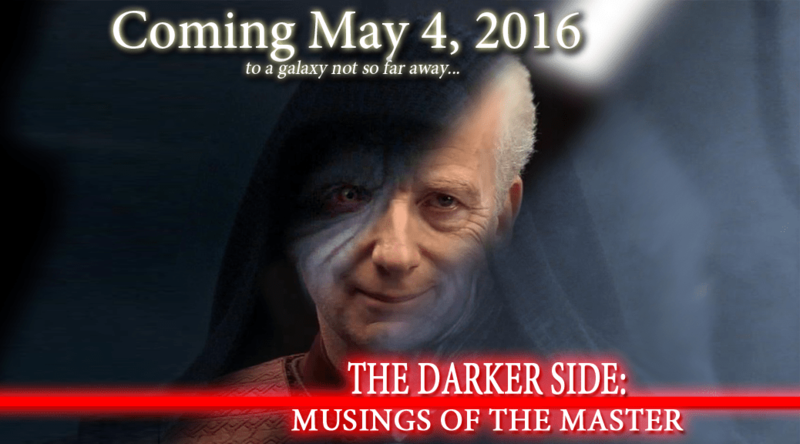 Coming May 4th to a Galaxy Near You! My free NaNoWriMo Web novel will be distributed here on my Website on May 4, 2016. Emperor Palpatine’s spies discovered Darth Vader’s personal journal (The Darth Side: Memoirs of a Monster) hidden away in private databanks onboard his flagship Super Star Destroyer Executor. Quietly upset by Vader’s musings and distractions, the Emperor set out to journal his corrections to Vader’s successes and failures—and share the true purpose behind everything he did for the greater good of galactic peace. You can read a chapter here!